Odds are you never heard of this film which is kind of a pity since based on my viewing of it with out subtitles its quite good. The reason you haven't heard of it is quite understandable, it was made in Germany during the war so it instantly was off limits for decades. 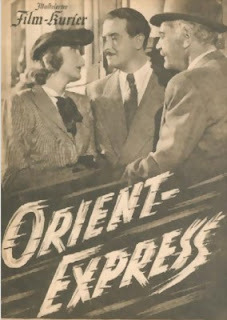 Orient Express is one of those treasures. The film concerns what happens on the titled train as it travels through the country side. We have the various characters we might meet in any film including two love birds, several suspicious people and a jazz band. This last bunch is really neat addition since their practicing and jamming drives some of the first half hour of the film as their music underscores whats happening elsewhere. When one of the love birds accidentally pulls the emergency break in a tunnel the conductors are forced to go compartment by compartment to see who pulled the handle. When they open one door they find a dead body.... At this point the police are summoned and it becomes a quest to find out who did it. Unfortunately the film is only in German and I couldn't get all the details but I've seen enough similar films that I could follow what was happening with out much trouble. Its your typical murder mystery done up on a grand scale. I'm not sure what I expected when I put on the film. I know I wasn't expecting something that was going to look as good as the MGM and big Hollywood productions of the period. I know I wasn't expecting something that seemed so frivolous as this. I guess I was expecting some sort of war time story instead I got something that was clearly made to distract the population from the horrors outside the theaters where this would have played. The cast is great with everyone selling their parts as best they can. The craft of the film is wonderful. As I said earlier much of the first half hour is underscored by the jazz band and it adds a great deal to the proceedings. I love how the camera moves in and around the train cars and between the characters. Its a wonder to watch and at times you wonder how they did it because the camera seems to be moving through solid walls as it reverses shots in such away that you'll wonder how they could be on a train and do what they are doing. It's movie magic of course, and it's done with cutting and shifting walls but it's so seamless it boggles the mind. The only thing I can compare it to is the Oscar winning Murder on the Orient Express made three decades later. I also love that the film is very adult in what it's doing. The best example is a late in the film attempt at spying is done by scratching away a poster on a glass in the exact location of a woman's breast in order to create a peep hole. You'd never see that in Hollywood. I don't know what else to say other than this is a super little mystery that I'm going to have to track down in English. I suggest you do something similar. New York Comicon Day 1 a minimal report.